Alien Trilogy holds a bit of a special space in my heart. Why this is to this day I still do not know. Basically AT is a Doom clone with Aliens in this first person title, especially these days, is about as vanilla as they come. 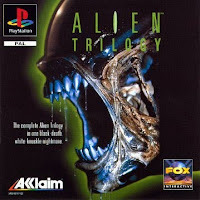 But back in early 1996 when this title was released (and I played it on the Sega Saturn) it was probably one of the best titles around excluding the Atari Jaguar’s AVP title. Each section has a basic goal – exit the level. But they’re disguised as “do this and that” tasks to get you through the level. There are numerous weapons, all authentic to the series (my fave is probably the smart gun which, as it’s name implies, seems to injure all enemies on screen no matter where your pointing it). 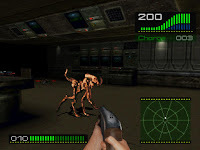 The enemies are varied, besides the facehuggers, chest bursters, and aliens there are alien types (human, dog, etc) and infected humans and android types all over the place. You also have mercy kill people cocooned into walls frequently who used to live on the planet. Each section of the game, which I’ll get to in a second, also has a large queen attached in a large open space. The game also has a number of secret areas with extra pickups, access to guns you’d normally find later much earlier on, and the like. The game also ranks you for how much you “completed” (or basically accessed), the amount of enemies you killed from that map, and how much of the secrets you found. To this day there are still a few secrets I’ve never found and the odd few I’ve unlocked but have no idea how and have probably only done it once. Very odd system. By today’s standards the cutscenes are fairly poor, but back in the mid 90’s they were adequate. The drop ship and corridor sequences riffing off the second Alien film the most and sets up the game well. But this is the main bit of ‘Alien Trilogy’ that kinda annoyed me. They had to take a bit of liberties with the idea to get the content into it as a movie trilogy rather than just making something different. So you are playing as Ripley. But she’s bald. Like in Alien 3. But you start the game as events unfold in Aliens. Then you go through a prison on the planet…. which is supposed to represent Alien 3, which took place elsewhere, and then you visit the ship from Alien with the Space Jockey for the final part. My other main annoyance is just the setup for getting through. The opening shows Ripley just takes off to save the team, but thats silly because there is no team to save. And unlike the Alien’s film where she risks herself to do it, she runs in with a handgun but then the people left behind just order her to do stuff to get more people back in. Are they company men? Trying to get the Aliens? I don’t know. Sadly there isn’t much of a story… and for the number of times I’ve finished it I can’t even the ending, because I don’t think there is one. A proper one anyway. Probably should check really before I say this, but in any case it’s not memorable at all. As another example of how it clearly also sits well in my memory, the PlayStation version at least – which is the one I played the most and owned first – by the fact I can remember the cheat menu password by heart – 1GOTP1NK8C1DBOOTSON. I unfortunately doubt how much the game is really worth these days, but I own 2 copies, PS1 and Saturn. In fact while searching for a box shot earlier I actually found a full copy of the PC edition on an abandon ware site (sans cutscenes and audio files). One day I’ll probably pass them on, the Saturn version probably as a part of a package, the PS1 edition… as it is I guess. But for old times sake I’ll probably give them one last shot.